Brunswick stew is a traditional dish from the southeastern United States. The origin of the dish is uncertain, and there are two competing claims as to the place in the South where it originated. A debate currently exists as to whether Brunswick Stew was actually originally made near the town of Brunswick, Georgia, or in Brunswick County in southern Virginia. Left: Brunswick stew made with chicken. Recipes for Brunswick stew vary greatly but it is usually a tomato-based stew containing various types of lima beans/butter beans, corn, okra, and other vegetables, and one or more types of meat. Most recipes claiming authenticity call for squirrel or rabbit meat, but chicken, pork, and beef are also common ingredients. Some versions have a distinctly smoky taste. The stew essentially resembles a very thick vegetable soup with meat. 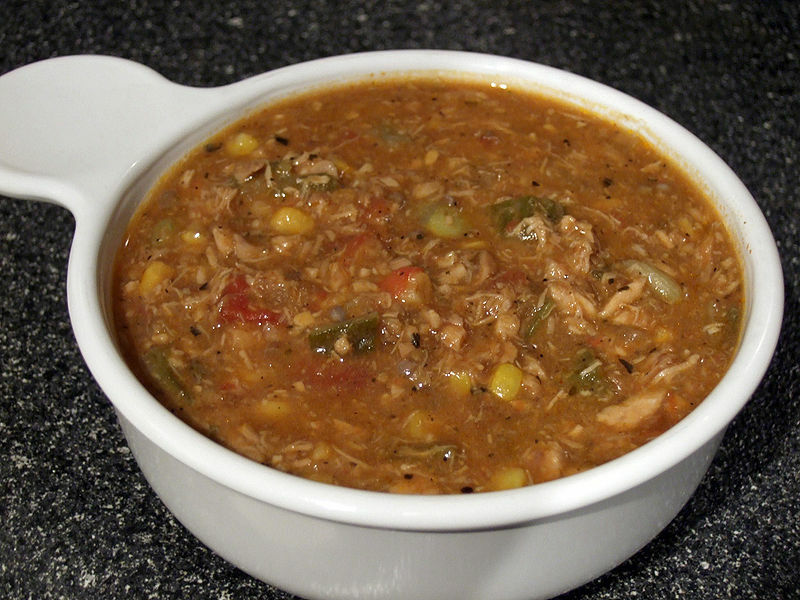 The key distinguishing factor between soup and Brunswick stew is the consistency. Brunswick stew must be thick; otherwise, it would be vegetable soup with meat added. Most variations have more meat and vegetables than liquid. The main difference between the Georgia and Virginia versions have been the types of meat used. The Virginia version tends to favor chicken as the primary meat, along with rabbit. The Georgia version tends to favor pork and beef along with squirrel. As there is no "official" recipe for Brunswick stew, it is possible to find chicken, pork, beef, and other types of meat included in the same recipe. Today, Brunswick stew, like Burgoo, a famous part of Kentucky cuisine, is most notable for being sold for church fundraisers throughout the South. In most areas where Brunswick Stew is being sold for fundraising it is cooked in large iron pots over open flame or gas. Unlike soup, the stew is usually allowed to simmer and cook for long periods of time. This may be attributed to the older tradition of putting wild meats into the stew, which, depending on the meat, might require longer cooking times to assure it was tender. Makes approx. 3½ cups of sauce (set aside - to be added later). Slow simmer for 2 hours.